"What do we need? ANIMAL RESEARCH! When do we need it? NOW"
"No more threats, no more fear. ANIMAL RESEARCH NEEDED HERE"
"Cures for cancer, what's the answer? ANIMAL RESEARCH! ANIMAL RESEARCH!" Posted on April 8, 2010 April 9, 2010 by EditorPosted in Campus Activism, NewsTagged animal research, animal rights, animal testing, animal tests, david jentsch, Kevin Quinn, Michael Steinmetz, National Eye Institute, National Institute of Health, National Institute of Mental Health, NEI, NIH, NIMH, pro-research, pro-test for science, Quinn, Steinmetz, Tom Holder, ucla. I’ll wish you gentlemen goodnight. It is 10.15pm in the UK and I should have been watching a Harry Potter film on TV instead of being lured into debate. OK – thanks for your honest amendment. But I’m not anti-research. I’m anti experiments which cause pain and suffering to the most defenceless, voiceless of creatures, based on our power to do it. I raised the ethical questions above, but they went unanswered. Animal experiments involve a significant element of “might is right”. True ethics is based on how we treat the weakest, all the rest is power bartering. More and more of the key research is basic studies, but that is increasingly done in non-animal work, because that is far more effective and cost-efficient. The future lies in this micro research, I believe. I financially support medical research on a regular basis, but I target my money precisely, just as these new non-animal techniques are much more precise and overcome the problems of species difference which so plague animal work. Teaching History was how I earnt my living and I have done detailed studies on the results of wars. One of the socio-economic results of 20th century wars was huge jumps forward in medicine – precisely because they had human battlefield casualties which they had to try things out on which could not me mimicked in peacetime. It’s a bit like when Fleming first tried penicillin on a patient. He tried it on a cat, but the result would come too late -the patient was going to die first. So he used it on the patient, who recovered. The cat died. 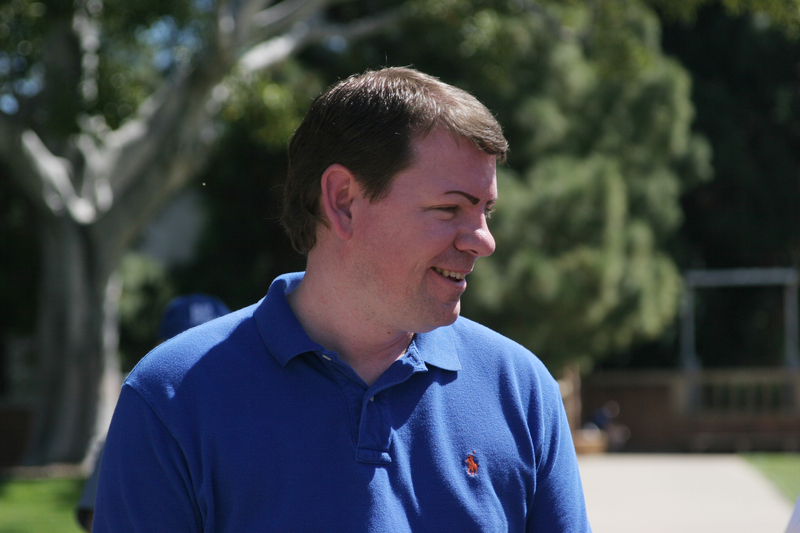 I didn’t narrow the argument – it was Tom who referred to me specifically, so I answered his comment about me personally. And I never hear animal experiment supporters refer to the failure of animal methods, so that works both ways. I’ve actually written about Fleming’s friend and penicillin in our “Bad science” section. It’s an interesting story which illustrates how anti-vivisectionists twist the truth. ‘Another story repeated by anti-vivisectionists including Ray Greek is that of Florey’s cat. In 1942 during the early trails of penicillin friend of Fleming was dying of streptococcal meningitis and Fleming wished to treat her by spinal injection of penicillin, so he asked Florey about it. Florey injected a cat via the spinal canal with Penicillin and the cat died, whereas Fleming’s friend made a complete recovery after the same treatment. What this story misses out is the bigger picture. Penicillin is a neurotoxin, and is never administered directly by spinal injection because of the risk of serious damage to the nervous system (1). Even very high doses administered intravenously can cause damage to the brain and nervous system (2). In short Fleming’s friend was very, very lucky to both recover from her infection and avoid serious brain damage. 1) Walker AE, Johnson HC, Kollros JJ “Penicillin convulsions: The convulsive effects of penicillin applied to the cerebral cortex of monkey and man” (1945) Surg Gynec Obstet 81:692-701. So Florey’s cat in fact was a better predictor of the effect of spinal injection of penicillin than Fleming’s patient was (I also suspect that a larger dose was administered to the cat). Fleming got a lot of publicity but I’m not convinced that his success made a huge difference to the future of penicillin. Penicillin had already proven successful in animal tests and partially successful in two human patients – both were responding well but one died when it ran out before treatment could be completed while another died from an unrelated medical problem – and Florey’s team were producing more and more penicillin. Their success in developing better and better methods of producing penicillin was key to the success of Florey’s team as the early forms of penicillin degraded very quickly in the body (mouse, rabbit or human). In fact it was his inability to produce sufficient quantities of penicillin to overcome its quick breakdown that was one of the major factors that halted Fleming’s earlier work. As to battlefield medicine, animal research made a huge contribution to the advances that saved many lives, one example is Dwight Harken’s pioneering heart surgery to remove shrapnel from the heart, using a technique he developed through operations on dogs. This technique not only saved the lives of hundreds of soldiers during WWII but helped (along with many other animal and human studies) pave the way for the enormous advances in heart surgery we have seen over the last 60 years. No one here doubts that in vitro research or clinical studies make a huge contribution to medical progress, but it is important to acknowledge that animal research plays a vital role alongside them. You know already know what I will say about aspirin, penicillin and all the rest, so i won’t bother. Readers can just consult “Safer Medicines” or “The Physicians Committee for Responsible Medicine”. And it’s not only the USFDA figure which shows the dodgy nature of animal tests. But on minimum standards of care, can you clarify.? Are you saying alll experiments io aniimals n the USA have to be pain free? Are experiments involving burning, poisoning, drug testing, brain damage etc banned or are they all totally under anaesthetic the whole time followed by death? Or do you mean that people can do these things at home to their pets? Perhaps you mean that they have to be cared for UNTIL tpain is caused in an experiment. In the UK experimenters can gert a licence to cause substantial sufferimng, whereas at home people would be put in prison for it? I’m interested to know whether you will answer these questions.with a direct answer. I take issue with this, I have just directly explained the meaning of the misused 92% statistic and you continue to refer to it as if it’s a legitimate argument. You cannot now say “well, also ________” because the those arguments are invalid – I would like some kind of acceptance that groups like PCRM appear to be purposely misleading people using “facts” like this. It would be very unusual for any experiment using burning, poisoning or brain damaging not to be done under anaesthesia. There are few absolutes – however the IACUC committees exist to ensure that there is no unnecessary suffering going on (suffering that could be removed without compromising the experiment). In the UK and US you could “get away” with a substantial level of neglect without breaking animal cruelty laws – researchers could not get away with this under animal welfare laws guiding laboratory research. I think you and many others have a misguided view of animal research. Only part of it is developing potential cures for diseases in humans through clinical trials. There is also an enormous amount of basic research that goes on, studying individual protien functions, how specific genes act, etc. Additionally there is much research devoted to the treatment of animals. It’s why there are cures for such things as Heartworm and Distemper. Although we can debate the merits of the current war the US is involved in in Iraq and Afganistan, the truth of the matter is that a wounded soldier now has a 95% chance of survival. In Vietnam is was 23.9%. While some of that has come from improved protection, a large part is due to better procedures. How do you think those military surgeons developed ways of patching up some young soldier that’s been shot or injured by an IED? Is it better to let them die? My problem with most anti-research activists is that they try to narrow the problem to a very narrow arguement. Just because it didn’t work for you doesn’t mean it doesn’t work. 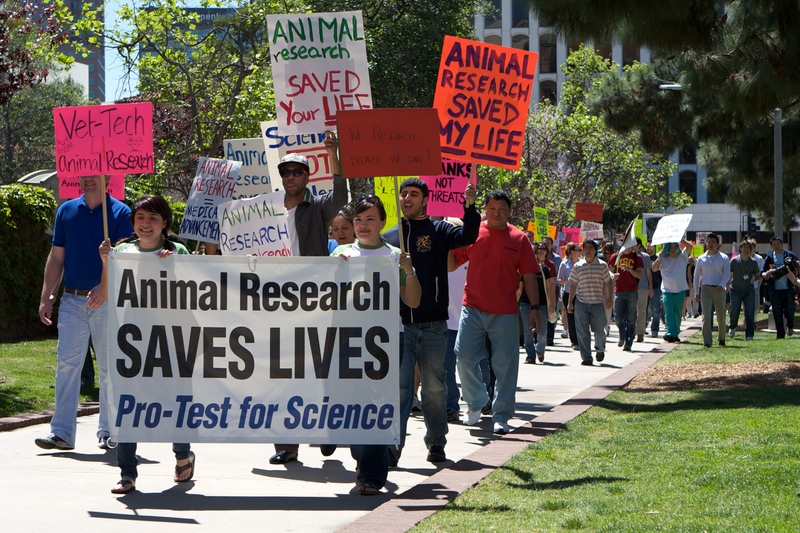 For others, animal research has literally meant the difference between life and death. Is it better to let them die? I’m sorry, 23.9% of soldiers in Vietnam died of their wounds, it wasn’t the survival rate. Now it’s 5-10% die from their wounds. OK, no philosophical debate. – I am aware your mind is made up too. I just wondered if you were willing to go public on those questions I asked. But it’s odd that those whose only duty is animal welfare support painful experiments on them – I don’t understand that. You’ve got me worried – my doctor’e duty is my welfare…. I don’t benefit from animal research, by the way. The USFDA figures show 92% of drugs passed by animal tests fail at the human stage. For the disease which I have suffered from for many years, the main line of research for 30 years was guinea pig experiments. They have now given up on these as unpromising. Perhaps they have delayed a cure. Still, come back to England some time and we can debate face to face as we once started. As far as “painful experiments” – the minimum standard of acceptable care in a laboratory is considerably higher than in the home. If you have taken medication, for a headache, a cold, or something more serious – you have benefited from animal research. Furthermore nearly everyone in the UK has had a variety of vaccines, so even if you hadn’t – you benefit from everyone else taking these vaccines and preventing the spread of diseases like measles, mumps, TB, Meningitis, flu … the list goes on. Barry you have my email address if you want to have a debate (alhough we both know that your mind has been firmly made up for a while). There was certainly a large number of researchers, as well as large numbers of veterinary staff and technicians (those who’s only duty is animal welfare). 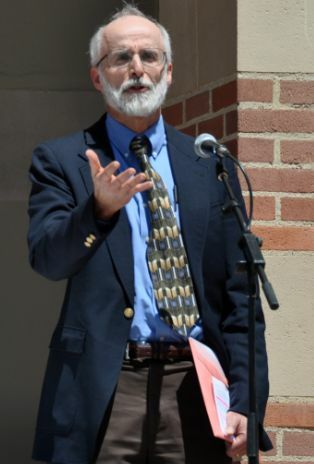 However everyone there was self-interested insofar that they will all benefit over the course of their life from medicines derived from animal research (just as you benefit). 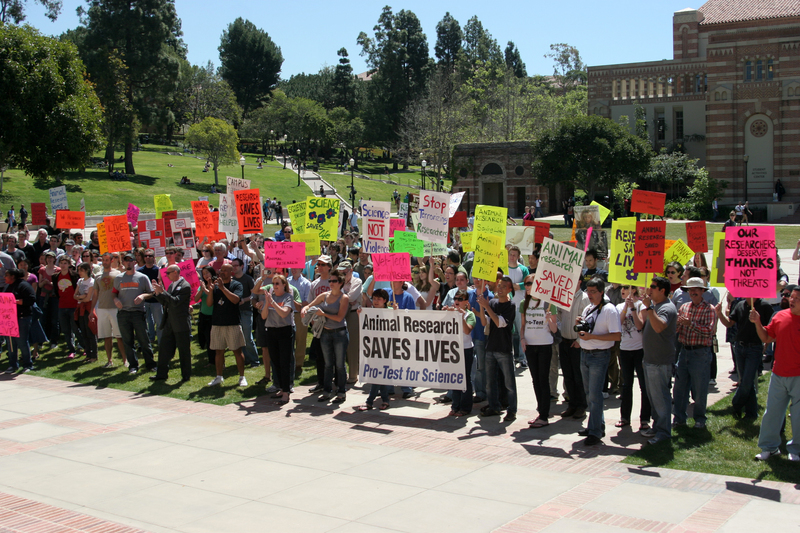 How many of the people at the UCLA rally were professors and students from departments experimenting on animals and thus with interests in their own practices and careers? I understand that you may not be able to be absolutely precise here, but I know you must have an approximate idea. Incidentally, do you think there is any limit to the permissible violence, in quantity or quality, to animals for any perceived human benefit? Do you think that power, for example derived from superior intelligence, is its own justification? Do you agree with bullying, for example of the weakest, defencesless and voiceless? I’m a bit dubious about these numbers. Sounds a bit hyped up to me. The last Pro-Test rally in Oxford a few years ago claimed 200, but there were actually only about 75 – individually counted. The organisers were overheard despairing about the numbers in the pub afterwards and there was never a Pro-Test rally again in Oxford and Pro-Test in the UK is now virtually dead. The people on the rallies are largely students using animals or those who have, or expect to have, careers researching on animals (Tom Holder is an exception – did I recognise your style in this write-up, Tom?). I know Oxford physiology students who changed courses to avoid the experiments which the system and their professors expected of them. 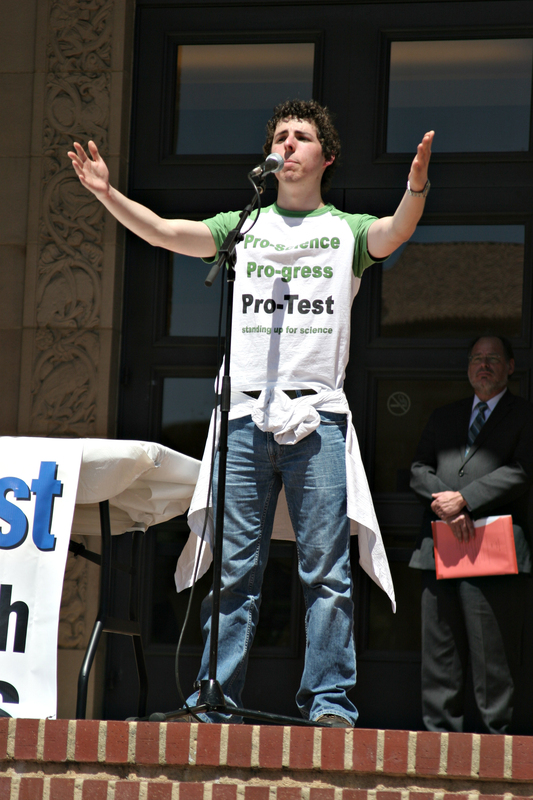 Might I suggest that Pro-Test rallies should be called “Save Our Careers in Animal Testing”. 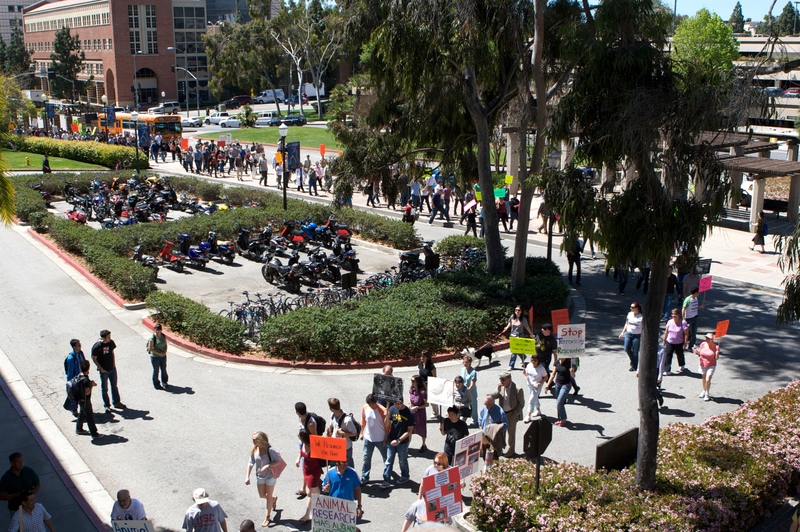 Under the hype, how many actually were there at this rally (I’m guessing a meagre 200 or less) and how many bioscience faculty and students are there on these campuses? As Private Eye in the UK would say “I think we should be told”. 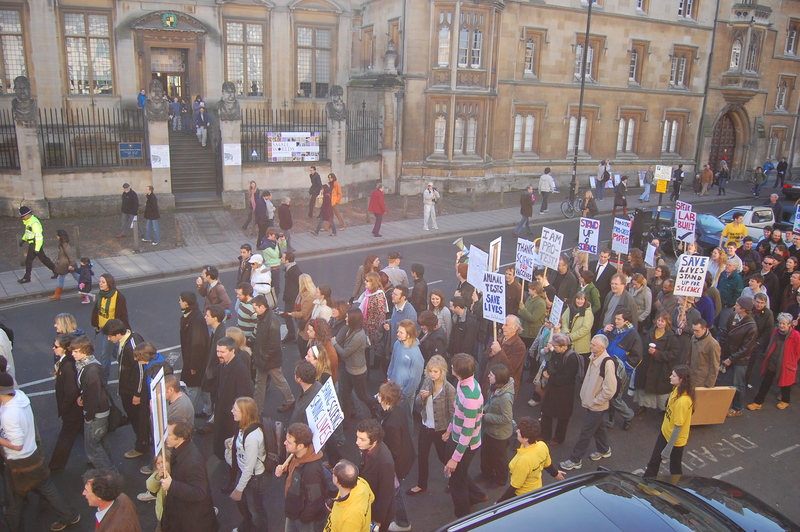 Above is a photo from the 2008 rally which shows only a section of the march (You can’t see the front or back), and has over 100 people in it alone (feel free to “individually count” them). 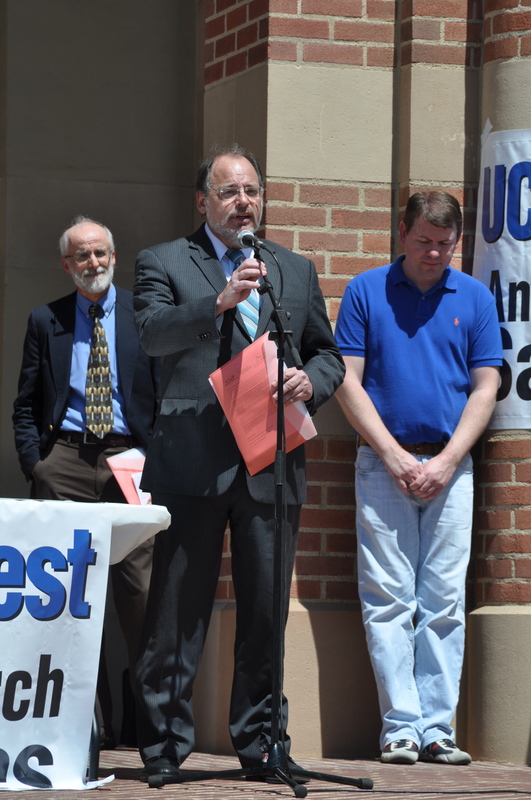 Pro-Test in Oxford has no need for rallies, but spends its time giving school talks, which it does with some regularity. Barry, I was a steward at the 2008 Pro-Test rally and can confirm that there were about 250 people there. A challange on that occasion was that there was a general recognition that we had already “won” over a year before, and it’s quite difficult to motivate people to come out and make a point that many felt they made very well two years previously. The feeling of urgency wasn’t there any more, after all be then the lab was almost finished (it’s since opened), and AR extremist attacks and harassment in the UK had decreased to a tiny fraction of what they had once been. Various polls of students in Oxford taken between 2005 and 2007 (after which interest in the issue decreased) showed support for construction of the new lab to be consistantly above 80%. The march itself was fun, the atmosphere was just about the most laid back I’ve ever exprerienced on a march, and it felt like a victory rally marking the end of the “activist” phase of Pro-Test’s activities in Oxford. I don’t remember any “despairing” in the pub, mostly discussion of what we should do next, with school talks and other more conventional science outreach activities being high on the agenda. 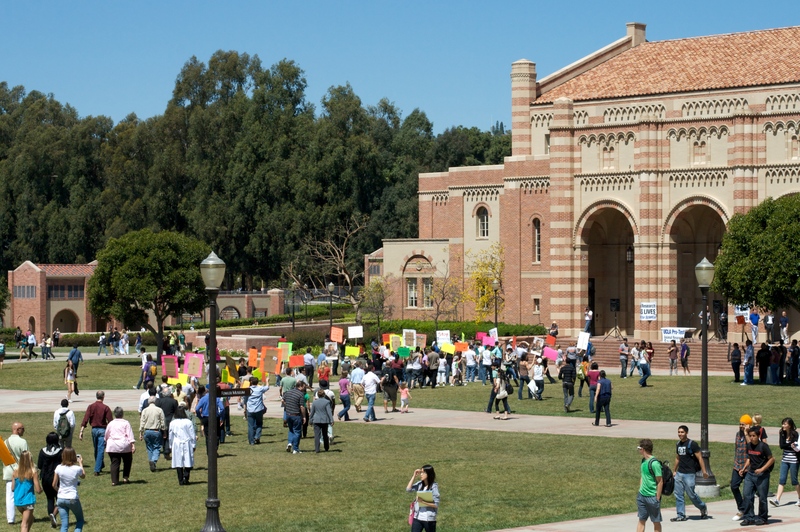 I suspect that a similar situation applied at UCLA, it’s a lot easier to motivate people to make a point the first time around, and as with Oxford the situation has improved in LA since the 2009 rally. 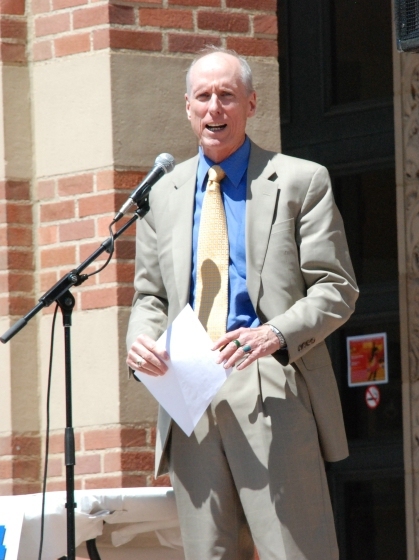 About 350 joined the march across the UCLA campus, but about 200-250 listened to the speeches at either end…I guess our supporters are busy people! It sounds like a great rally. Keep up the good work! Congratulations on another successful rally! 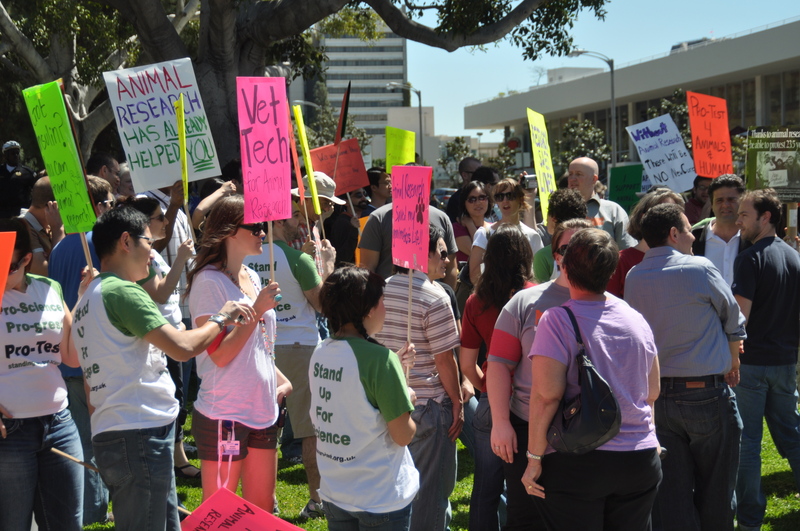 Thank you to all of the organizers and participants who made a powerful stand for animal research, scientific progress, and civil, open dialogue about this important issue. Your efforts inspire us all!